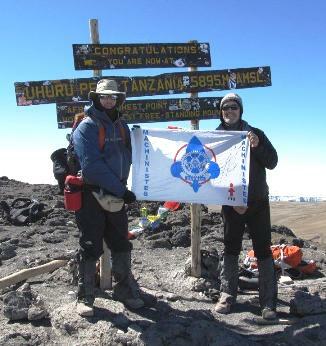 From left to right – IAM District 140 General Chairperson Michel Pelot proudly displays the Québec Machinists flag atop Mount Kilimanjaro with fellow climber Robert Piché. Michel Pelot looks at cloud cover much differently than he used to, but climbing the world’s fourth largest mountain tends to change one’s perspective on such things. The climb is limited to five to six hours each day, which includes camping in tents under the stars and above the clouds where temperatures can dip down to minus 27 degrees.